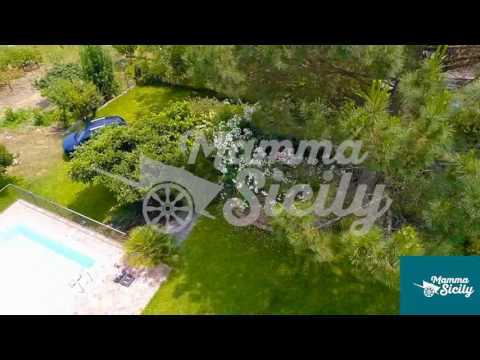 Prestigious Sicily villa in Etna park, located in the town of Viagrande. The villa is fully immersed in a green park with a wonderful view of the Ionian gulf (10 kilometers away). The villa spreads on two levels and is furnished with stylish and comfortable furnitures. There are 2 double bedrooms and one twin. The house shows many living where to enjoy relaxing moments and a technological and fully equipped kitchen. The outdoor shows a comfortable pool area, a lush garden and a patio, ideal for summer meals, from where you may enjoy an unforgettable panorama of the Sicilian coastline. 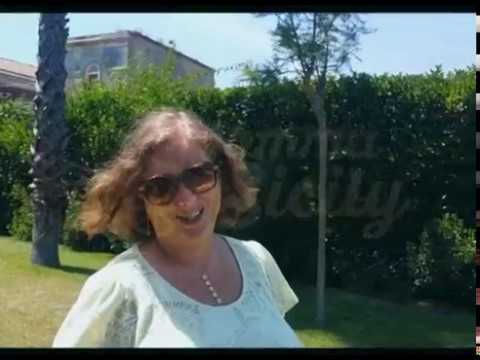 A great choice where to stay in Sicily! Since the owner is a football passionate, there is also a football court ! 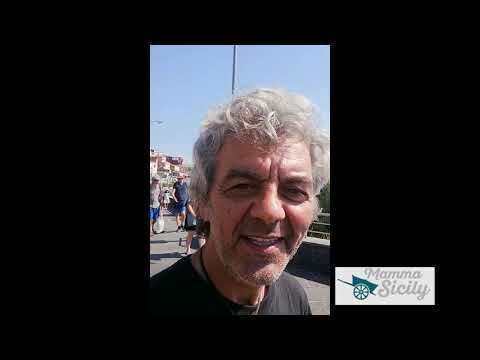 Have a nice trip in Sicily ! Viagrande (photo, 1 km) was the place were, in the past, aristocratic families used to spend their summer holidays. This is way, presently, we can still admire wonderful properties along this small and charming town, full of lush vegetation. Etna Park (Unesco’s), with its inactiv volcanos (the sons of Etna), caves, forests, lava grounds … lasts 10 km’s. Don' miss our Etna tour (photo), the most requested in Sicily a familiar-friendly experience that will allow you to have a real vision of Etna. Catania is10 km's away. I suggest you to park the car in Piazza Alcalà than have a walk: let's start from the worldwide famous Pescheria (photo, outdoor fish market), then to Piazza Duomo (the hearth of Catania) and from it take the Via Etnea, the main street of the town, a pedestrian walking full of shops, cafe and wonderful buldings in Baroque style. Let's walk for about a kilometer, visiting the Roman amphitheatre (in Piazza Stesicoro) until arrive to the Villa Bellini (Catania's public garden). Other places worth a visit are Acitrezza and Acicastello (5 km’s), both fishermen hamlets, where lava flow of millenia ago has modelled the landscape: in Acicastello you can find a stunning castle in lava stone overhanging the sea and in Acitrezza the Faraglioni (photo, sea stacks). Taormina (photo of Isolabella), the pearl of Sicily, is almost 30 km’s away: it’s a magic place with the amazing Isolabella and its narrow streets rich in history, a sort of vintage atmosphere and fashion: cool! 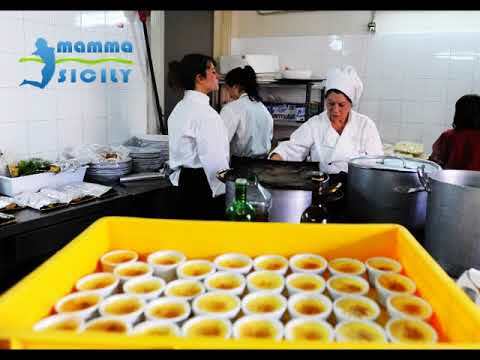 Its time to eat something and my tip is to do not miss the Pasta alla Norma (photo) and to have, at least once, a typical Sicilian breakfast: granita and brioche! My husband, 3 adult children and I spent 9 nights at this beautifully appointed villa and loved just about everything! Best features for us were the fabulous pool where we enjoyed gathering to refresh and relax after outings around Sicily, the upper patio where we enjoyed the gorgeous view while sipping pre-dinner drinks, and dining al fresco on the lovely patio by candlelight. 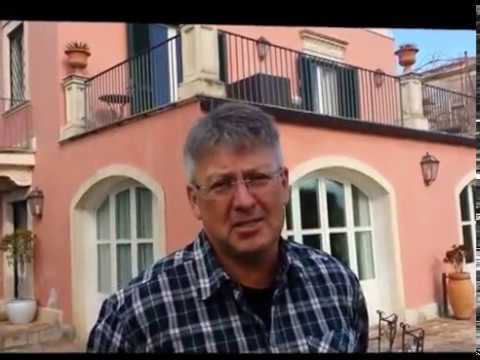 The location is close to several villages, wineries and small towns however we could not walk to anywhere as we had hoped to because the road the villa is on is extremely busy with fast cars and trucks. The upper bedrooms where the 3 kids slept were comfortable and much quieter. The kitchen was fantastic - big and great to cook in with lots of serving bowls and platters for the several times we purchased delicious local foods and wine and prepared simple but elegant and delicious meals enjoyed on the patio. 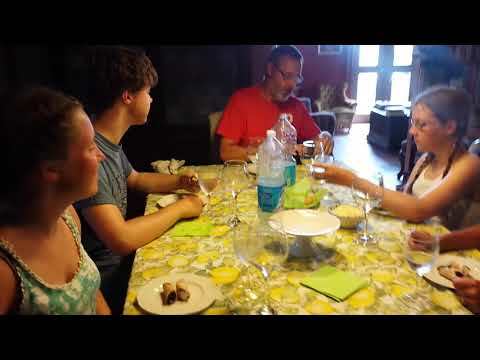 Definitely, a top highlight of our visit was a fabulous Sicilian meal prepared and served for us in our villa by two charming young women from Mamma Sicilia. The food was amazing and plentiful - a must for anyone wishing to taste some traditional Sicilian specialities! Mamma Sicilia also arranged for a personable and knowledgeable sommelier, Salvo, from Benanti Winery to pair some of the very good Benanti wines with our meal. We love fine wines and these were tasty and paired perfectly with our food. A most memorable evening for the whole family! Added bonuses included a lower football field which would be great for kids to run around on as well as several fruit trees we were invited to pick from. I'm not sure I'd bring very young children to the villa as the furnishings and decor were lovely with lots of lovely white upholstery... not good for grubby little fingers and toes! We will cherish many fine memories of our stay... and thank Demetra most especially! You can expect a very nice house which is well equipped with a big kitchen, and a huge and beautiful garden. The Villa, it's pool and gardens are undoubtedly quite beautiful, with ample living and lounging about spaces for groups or families. As a family, we spend the majority of meal times collectively cooking and the kitchen was quite fantastic with every conceivable device, pan, utensil and more, which suited us down to the ground. There were also generous amounts of basic ingredients and thoughtful gifts. We had brought our own Nespresso pods so we're delighted to find a machine to use. The barbecue was fabulous and we cooked lots of seafood and vegetables. We all had a lovely stay, the village of Viagrande is worth checking out, amazing cake shop and a good Pizzeria and the proximity to Taormina is a bonus. I don't often write reviews however such was our wonderful experience staying at Il Mirto e La Rosa in June 2017 I felt compelled to share. The people who managed the villa were superb starting with Giuseppe who answered all queries prior to arrival in a timely, helpful manner. On arrival Diego and his companion welcomed us and went the extra mile to make sure we were comfortable. We met the charming owner Signor Di Stefano, a perfect host, and Mama Sicily director Giovanni dropped by towards the end to ensure we had enjoyed our stay. I have nothing but praise for all who acted professionally but with a personal touch and left a warm impression of the Sicilian people. The villa itself is every bit as stunning as the photos suggest with so many positive aspects.We enjoyed several barbecues there in the wonderful June climate. The 1st floor terrace was a particular pleasant feature to be enjoyed during the day and evening for a bit of quiet away from the pool during the day or to enjoy a drink in the evening. The pool was perfect and we made the most of it day and night with lighting in the evening making it a added visual treat. The gardens offered space but also function. My son and I had a football pitch with goals either end to enjoy ! There is a citrus grove offering fruit and a vineyard to add to the grandeur. Inside the villa the decor is very tasteful whilst at the same time very comfortable and cooking fans will love the kitchen which is perfect for a chef its so well appointed. On location you are in the outskirts of Viagrande which is a reasonably sized town with its own charm and whilst you would need a car,(no footpath most of way from villa to town), we found the villa to be well situated as a base to see the best of the east coast, (we made trips to Etna, Taormina,Savoca, Siracusa and Aci Trezza, all easy to reach). Anyone interested in staying should feel confident that they will find a superb package contained here. Every aspect was perfect. There is so much to say about this property but to sum up there is no higher praise than to say we really didn't want to leave and definitely aim to return. Book with Complete Confidence.